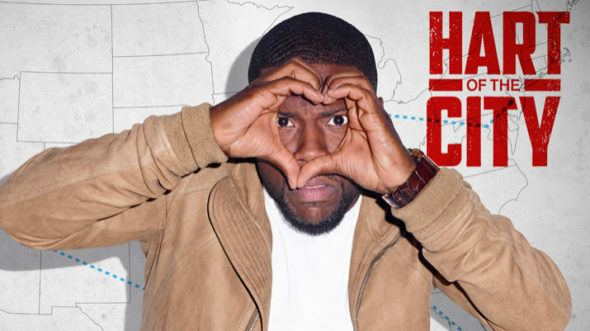 Comedy Central has renewed the Kevin Hart Presents: Hart of the City TV show for a second season. The actor and comic executive produces with Dave Becky of 3 Arts Entertainment, Leland “Pookey” Wigington, and Joey Wells. Kevin Hart Presents: Hart of the City follows Hart as he seeks out the funniest voices in local standup. The second eight-episode season will premiere in 2017. The first season finale airs on Comedy Central, this Sunday, November 20th at 11:30pm ET/PT. Get the scoop from this Comedy Central press release. NEW YORK, November 18, 2016 – Kevin Hart continues his travels across the country in search of fresh comedic voices as Comedy Central has renewed “Kevin Hart Presents: Hart of the City” for a second season, it was announced today by Kent Alterman, President, Comedy Central. Executive produced by Hart, Dave Becky of 3 Arts Entertainment, Leland “Pookey” Wigington, and Joey Wells, the second season of eight episodes will premiere in 2017. “We are pushing Kevin to develop a stronger work ethic,” said Alterman. Currently airing on Sundays at 11:30 p.m. ET/PT, “Hart of the City” follows Kevin Hart through each destination as he seeks out the freshest and finest voices in the local stand-up scene and investigates the nuances that make it unique. Each episode features stand-up sets from a different group of local comedians with interstitial segments featuring Hart and those comedians discussing the comedy climate in their city. The first season visits Atlanta, Houston, Chicago, Sacramento, Miami, Washington, D.C., Philadelphia and Birmingham. Harry Ratchford is Co-Producer and Jonas Larsen and JoAnn Grigioni are the Executives in Charge for Comedy Central. Kevin Hart is a tour de force in film, television and live entertainment. Hart’s recent movie projects include the animated film “The Secret Life of Pets” (Illumination Entertainment); “Central Intelligence” (New Line Cinema and Universal Pictures), the year’s biggest grossing live-action comedy; “Ride Along 2” (Universal), which grossed over $100 million worldwide; “The Wedding Ringer” (Screen Gems), and “Get Hard” (Warner Brothers). He’s currently filming “Jumanji,” which will be released next December. Hart stars in and executive produces the television show “Real Husbands of Hollywood” (BET) which wrapped production on Season 5, and, in addition to “Hart of the City,” is signed on to launch an untitled stand-up series with Comedy Central. Universal Pictures released the feature version of his comedy tour “WHAT NOW” in October. Hart’s 2012 comedy tour “Let Me Explain” took him to 90 American cities plus Europe and Africa, resulting in Hart becoming the second American in history to sell out London’s O2 Arena. In September 2011, Hart released “Laugh At My Pain,” the feature film version of his comedy tour of the same name. In 2009, Hart’s one-hour Comedy Central special “I’m A Grown Little Man” became one of the highest rated specials for the network, and in 2010, Hart’s DVD “Seriously…Funny” was one of the fastest selling DVDs, going triple Platinum, aided by the Comedy Central special of the same name, the highest rated comedy special of 2010. What do you think? Did you watch the first season of the Hart of the City TV series? Will you tune in for season two on Comedy Central? More about: Comedy Central TV shows: canceled or renewed?, Kevin Hart Presents: Hart of the City, Kevin Hart Presents: Hart of the City: canceled or renewed?